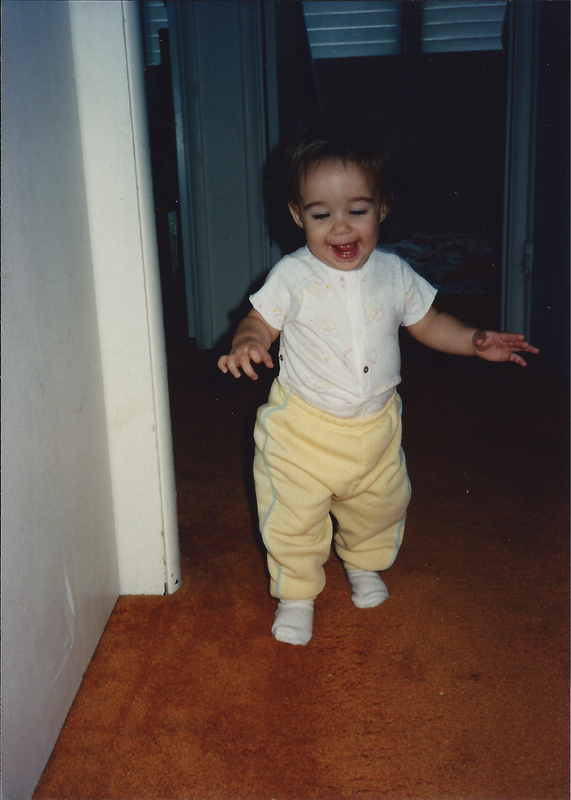 Twenty-one years ago, days shy of her first birthday, I let go of her chubby little hand and away she went. Then she kept on going. In preschool, she was queen of the monkey bars. In junior kindergarten, the most popular girl in the class. In fourth grade she had a reputation on the soccer field as being the player who made the most spectacular tumbles but popped right back up and raced down the field to get the ball back. With a sense of her own gifts as a leader, she seemed to relish being in the middle of the action, wherever that was. And whether it was orating in the Damon Speech contest, or portraying Viola in Twelfth Night, or the many times she stood, bedecked in paʻu, lei poʻo and kupeʻe on various kahua hula — to be on stage was like being home to her. When it comes to stepping out on her own, my girl is just getting warmed up. At 22, having long since let go of my hand, she has all the confidence she needs to make her own way in the life that lies before her. So today I blow her a virtual kiss, and with a heart full of pride, watch her step out into the adventure of adulthood. Happy Birthday, my angel. E kūlia i ka nuʻu: strive for the highest. This entry was posted in counting my blessings, Family, Kids on March 25, 2013 by plum. Look, I understand that listening to someone who lives in a tropical paradise whine about her problems is not what you signed on for, but can I just have one more swing at it? Then, I promise, pau. First whine: I’ve gotten accustomed to people (and when I say people, I’m including the quadruped member of the family) being healthy around here, fully functioning and at the top of their games. So when they’re not, it’s a bit of a challenge for yours truly. Three weeks ago, it was our boy who suffered surgery on the sole of his foot. Originally there was thought to be an inclusion cyst there; turns out it was a rather large plantar wart. Upshot: doctor’s orders to be 100% non-weight bearing on the foot for a full three weeks. Crutches only, no walking, no driving even. Definitely no surfing, which is probably the biggest difficulty of all. I was going to say this looks worse than it is, but the truth is, it’s exactly that bad. So, it has fallen to me to do for him all that he cannot do for himself. I do however draw the line at bathing; it’s been a couple decades since I’ve had that responsibility, and that’s exactly as it should be. I did go to the pharmacy and purchase a bath bench and a special plastic bag for covering his leg so that he could perform his own ablutions without compromising the dressing, so you can’t say I’m not doing my part. But that still leaves making his breakfast (and washing the dishes), packing his lunch for work, then driving him to work and picking him up in the afternoon. Then making his dinner and washing those dishes (which I’d be doing anyway, so that sort of doesn’t count). It feels almost exactly the same as having a school-age child, which, as I recall: I DID THAT ALREADY. And on top of all that, my four-legged baby also had to have surgery last week to remove a few cysts on his tummy and chest. 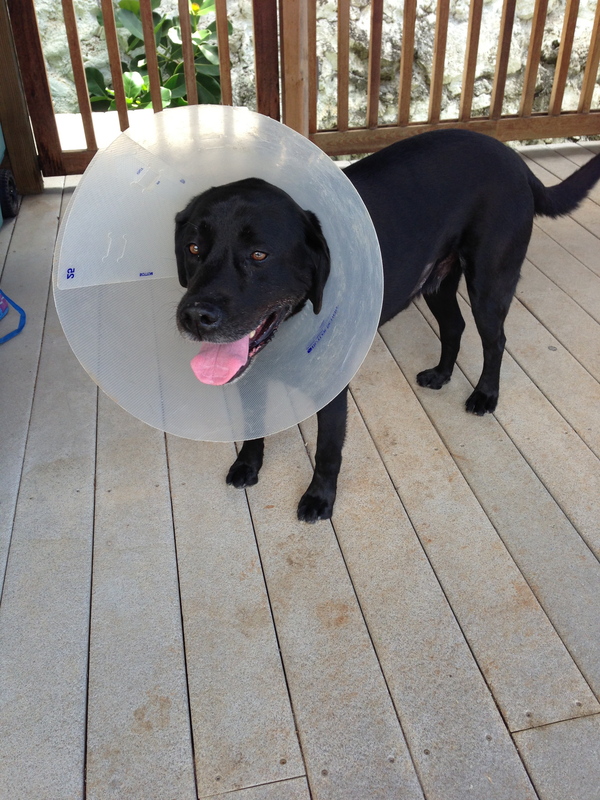 Which means the poor guy has been relegated to the Cone of Shame. So I’ve been administering pain pills and antibiotics and wrestling him into the COS so that he won’t lick or chew the stitches. Bless his heart, he’s been awfully patient with me and the whole process; I think if I were in his shoes — paws? — there might be some inadvertent biting here and there. And finally there’s the fact that I may or may not be about to have a birthday in a couple weeks, to which I have to say: UGH. The good news is my birthday consistently falls during Spring Break, a week off for The Coach, so for the past twenty-plus years I’ve celebrated on a (mostly) annual ski trip to Colorado. 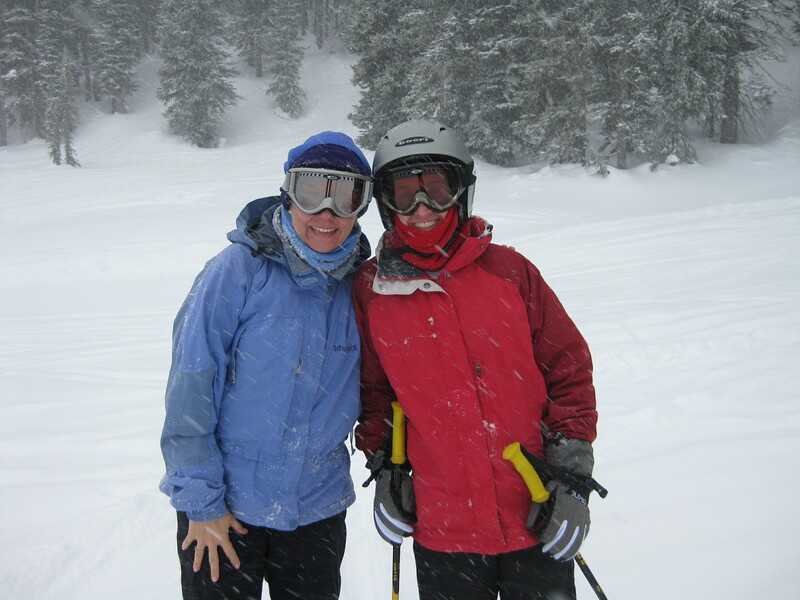 Maybe it seems odd that an island girl would enjoy snow skiing in the Rockies, but I learned to ski — and got hooked — in college, and ever since it’s been the best vacation activity I can imagine. The bad news is this year we are staying home. That has to do with the construction being approximately a month away from completion, and we have yet to make a decision about the wood for the bathroom cabinets, a ceiling fan, wall-mounted (or table?) lamps for the bedsides, a desk or desk design for the southwest corner, and a bookshelf configuration for the northwest corner. Plus the fact that a new bedroom and bathroom cost roughly ten times your average ski week. So, okay, I can live without a ski trip this time. However, I’m also missing our girl’s birthday. Hers is the day after mine, so we have always had a joint, two-day celebration. But for the first time in 22 years, we won’t be together on our birthdays. Which I’m trying my hardest not to dwell on, because it just makes me more blue. Recently when our girl and I have had a chance to talk — which hasn’t been often, given my various commitments [see above] and hers (being a junior in college; nuff said) — she has asked me what I’d like for my birthday. Oh, Sis, where do I start? I just want to hang out with you, go get pedicures, tell funny stories about the night you were born, eat cake and pretend all the other nonsense [see above] isn’t happening. That would be a great birthday present, but I suppose I can live with its deferral. Time moves on, after all. Stitches will be removed, crutches and Cones of Shame eighty-sixed, and building projects completed. It’s even possible I’ll come up with a solution to the pesky seven pounds. So, there’s nothing left to do but wind down the whine. Thanks for letting me get it off my chest. This entry was posted in Everyday life, Kids, Koa on March 12, 2013 by plum. The Coach and I were driving to a party the other night, and as we listened to the sports talk station, the topic of discussion turned to the fact that the University of Hawaii baseball team has started its season with a 1-12 record. Ouch. We’ve been followers of UH baseball for years, decades even, and one of the guys on the team is the son of friends, so we feel for them. As they say in the islands: pua ting. Naturally the speculation is all on whether and when those poor boys will be able to turn things around, and how much longer before people start asking about the coach and his contract. Before the season started they had been expected to do well, in their conference and overall, even given a challenging and competitive schedule. So far it hasn’t turned out that way, and it’s getting painful for fans to witness. Like the proverbial train wreck: too awful to watch, but too fascinating to look away from. The Coach commented: “You know, I’ve been through that before. We won the national championship my freshman year, but by my junior and senior seasons we were one of the worst teams in the country. “And you know what you do when that happens?” he posed. “Keep playing?” I ventured to guess. 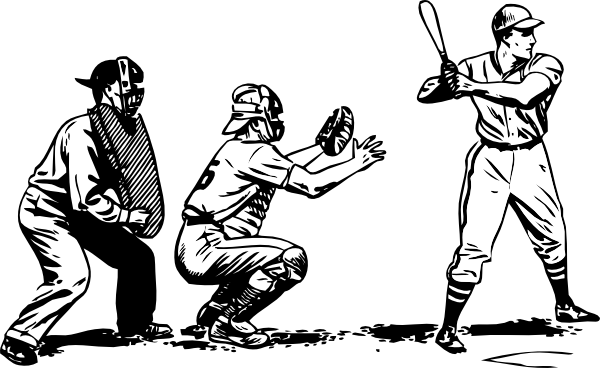 I’ve been dwelling a bit on that rhetorical question — “What’s the alternative?” — myself lately, as well as finding myself in deep sympathy with those poor baseball players. And Rory McIlroy, who I feel a little less sorry for, because of all the, you know, wealth. My own dilemma exists on a much smaller scale, of course, but it’s distressing nonetheless. I expected to have a different experience here with this blog: more productive, more consistent, more — I don’t know if this makes sense — helpful, somehow. But I seem to be in a bit of a slump, and no end in sight. Yet I know there’s nothing for it except to … keep playing. So far, I am; I try my best to show up and at least practice most days, even if there hasn’t been much in the way of actual product to show for it. And I offer my thanks for your patience, my dear readers (all four of you), as I travel through this dry spell. I’m thankful you’re not some virtual team owner who has the power to not renew my contract. Because that would probably be worse than any slump. This entry was posted in Being me and tagged slumps, writer's block on March 6, 2013 by plum. This showed up in my email inbox yesterday. Why is it that we get so upset when we hear of creatures like polar bears facing extinction, but things that have been important to our own personal existence can just disappear, never to return, and we don’t give it a second thought? It goes without saying that each item is values-neutral: neither good nor bad, right nor wrong. But that doesn’t mean each of us won’t see these 50 things — and there are a lot more than 50, as we know — through the lens of our own worldview. Which makes hard to look at each one and not say either: Yeah, good riddance to that, or, Oh, it’s too bad that’s not a part of our everyday life anymore. We just have our opinions, right? This may be more true for my generation than the ones above or below us. We remember how things used to be and can compare them to how things are today. So we look at a list like this and maybe get a little nostalgic, remembering how fascinating it was to thumb through the family encyclopedia. On the other hand, we’re thankful not to have to go down to the DMV to register our car. That’s when I got curious and conducted a little experiment. I went down the list and said “Yep” or “Nope” to each one, and you know what I found out? I was split exactly 50-50 between Things I Don’t Do Anymore and Things I Still Do, Even If Only Sometimes. Which tells me that I really truly am the Sandwich Generation. Because most of the things on the list are things to which my kids would say “Nope” or “Huh?” But, my parents would most certainly say “Yep” or “Of course, doesn’t everybody?” to almost every single one. So, for the record, here are some of the ones that made me sad to think are gone forever: 7, 11, 26 (because in my opinion, memorizing phone numbers and other things like poetry and Bible verses is a good idea for brain health. Personal quirk), 28, 34, 41, 45 and 46. Notice how many of those have some sort of relationship to writing or the written word, and/or the idea of a discrete, tangible thing that you can see or hold, keep and carry. I don’t quite know how to articulate it — paper vs. ether? — but that quality seems significant somehow. There are others that I suspect are not fully extinct and never will be. Like #38: I try on shoes at the mall all the time. I do that to see what size I am in one brand or another, then I go home and order them on Zappo’s. And #39 is something — well, if you’re female — you can’t get around, because retailers sell lots of clothes with labels that say “Hand Wash Only.” Just maybe not, you know, with one of those washboard thingys. And #48, hanging laundry on a line, is making something of a comeback these days, what with all the emphasis on living a “green” lifestyle. Not to mention saving on your electricity bill by not using the dryer. And let me attest: getting into bed when you’ve washed your sheets and hung them to dry in the fresh air? Sheer ecstasy. But as for #47 — I’m never giving up my newspaper. Because that’s where the New York Times Crossword puzzle is, which I do faithfully, every day. In pencil. Call me old school, but some things are just sacred, you know? This entry was posted in Everyday life, Middle Age, Random stuff, Sandwich generation on February 21, 2013 by plum. I’ve been conducting an informal survey of various friends who have undertaken renovation, remodeling, and/or home building projects. Fairly consistently, most have had their projects spurred by one teeny, tiny thing that mushroomed into an enormous — or at least, large — undertaking that went on to utterly overtake and dominate their very lives. In other words, hardly anyone sets out to do The Big Build, right off the bat, from the get-go. Usually it’s just some little problem to be solved, a mere trip to the hardware store — and the next thing you know, your world is spinning out of control and you’re up to your ears in contractors, subcontractors, and building permits. One friend whom I surveyed at brunch on Sunday said that their project began as a little landscaping issue that needed to be addressed. Which turned into demolishing the existing cottage and building a 4,000+ square foot, absolutely stunning, completely custom home. So that made our little leaky pipe look like small potatoes. Our particular saga began when I was showering one day and noticed the water ponding around my feet, taking its sweet time going down the drain. When The Coach got home from work, I asked him, “Have you noticed the shower drain’s been a bit slow lately?” He allowed as it had, and went downstairs to fetch his miracle drain unclogging product. This particular product is not a snake, not a plunger, not some caustic liquid you pour down the drain. In a way, it’s all of the above. I’m not altogether sure how it works exactly, but there’s this pressurized canister that you place over the drain, then a kind of plunger thingy that thrusts whatever is in the canister down into the pipe. I think the idea is sort of a controlled explosion. Which, as ideas go, with respect to almost-50-year-old galvanized pipes in the upper floor of a two-story home, is probably not a good one. And in our particular case — very, very bad. But at the time, we were all, hooray, the drain’s not slow anymore! and that was all that really mattered. Until the next morning, when I finished showering. As I stepped out of the shower, I heard water running somewhere. Nearby. That’s odd, I thought; it’s not raining and the sprinklers in the front yard had already gone through their cycle earlier that morning. So who had turned on the water, since I was alone in the house? I wrapped up in a towel and headed downstairs to explore. And immediately discovered the deluge in the living room. Torrents of water were gushing in sheets down through the ceiling. Wait; let me repeat that: Torrents of water. Through the ceiling. In sheets. Coming down on the chair-and-a-half, down on the ottoman, down on the coffee table, down on the oriental rug and our lovely Australian brushbox hardwood floor. I couldn’t think what to do first: move the furniture, grab as many buckets as I could, mop up with towels, collapse into sobs of helplessness, make an incoherent phone call to The Coach at work. So I just multi-tasked and did it all at the same time. Clad in nothing but a towel. After 30 minutes or so, the water had slowed to a trickle; just some drops here and there. At the same time, my state of shock had worn off and — now fully clothed — I was able to (slightly more) rationally assess the situation. This not being the first water-related disaster in our experience, we have a father-son plumber team practically on speed dial, so we summoned them (not really; we asked them ever so nicely) to the house to give us their own more accurate and professional assessment. So that was last July. In the meantime, we’ve pondered the problem from various angles — should we get at the broken drain pipe from above, by tearing out the bathroom floor, or from below, by tearing out the living room ceiling? — and with the help of other experts beyond our plumber buddies. Experts like our architect friend Mike, who is like a kid in FAO Schwartz at Christmas time, gleefully imagining all the possible ways to tweak this and redo that. And he’s a magician at getting what he wants. Once we decided we had to go through the bathroom floor, it was just a short step further to extend the whole tearing-out business into the adjoining dressing area, then the closets, then, oh, what the heck, why not the master bedroom? I mean, as long as we’re tearing stuff out and putting it back together, why not just put it back together in ten times better shape than we started? Oy. Or as we say in the islands, auwē. So that’s how we now find ourselves fully immersed in noise, dust and floor plans; picking out granite, tile, wood, lighting and closet configurations. (And for yours truly, more red wine, please.) We’ve got another six to eight weeks until conclusion, while we “camp” in our girl’s bedroom down the hall. It’s quite the adventure. But thankfully not as much of one as water gushing through the living room ceiling. 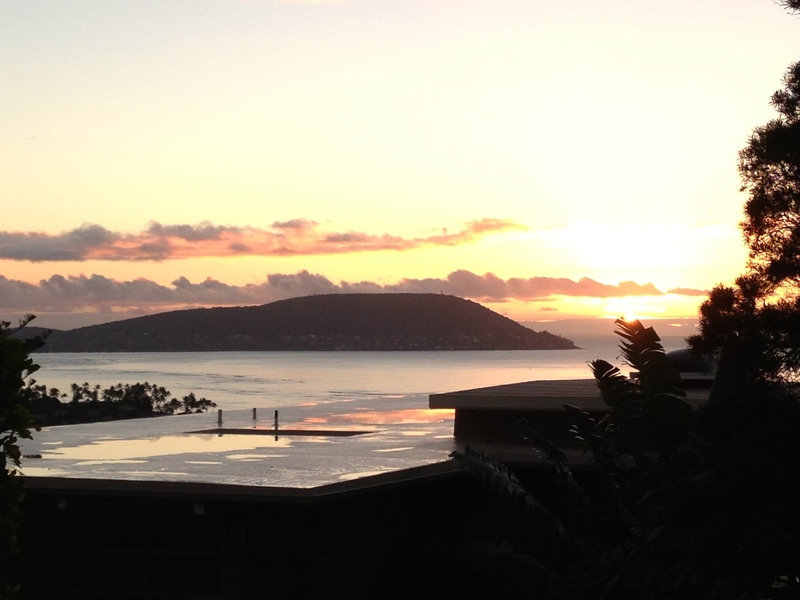 This entry was posted in Mai ka hale (house and home) on February 20, 2013 by plum. 1. Tonight The Coach and I are going out for dinner at a nice restaurant for Valentine’s Day. Yeah, we know it was yesterday; the flowers have already begun to wilt and the chocolates melt. But you know what? This way works for us. For one thing, yesterday was a school night. Kind of hard for teachers to go out for Date Night when they know they’ll be waking up, as usual, the next morning at 5:00. Plus, when you’ve been married 27 years, you have quite a few Valentine’s Days under your belt and so it’s okay to let them go by with just a card and a kiss on the actual day. Also, unless you started planning shortly after New Year’s, do you know how hard it is to get a reservation anywhere on February 14th? At our age and stage, let the kids have ’em; we’ll just settle for the next day, after the crowds subside. 2. But I’m going to ask our waiter how many proposals happened last night. Assuming young men are still into that sort of thing. I really have no idea, but from what I hear, it seems like men of what used to be known as marriageable age are either putting off the whole proposal/getting married thing or just forgoing it altogether. Which you can understand, given that they have, at that age, bigger fish to fry. Like getting a good job — or any job. In order to pay off their mountains of student loan debt. Then, when they’ve got all that more or less under control, you think they’re going to want to take it on all over again, with a big Say Yes to the Dress-type wedding? Not hardly. 3. Our boy falls into that “marriageable age” category, and is actually seeing someone who could potentially be a spouse, so I suppose I have a close-range view of that whole phenomenon. At 25, he’s in no hurry whatsoever to take that step; doesn’t feel ready for it all, and says so. By comparison, his grandfather, at age 25, had already been married for two years and had a baby. So there you go. Times change. 4. And anyway, I’m not ready to be a grandmother — although I could handle mother-in-law, I suppose — so this works out fine for all parties. Although it’s Kupuna [Grandparents] Day today for the kindergartners at The Coach’s school, and he’s having to fill in for a couple of the little ones’ absent grandparents. So I guess he’s getting some practice at it. 5. Speaking of our boy, it’s a good thing he does have a job with benefits, because he’s about to go in for minor surgery on his foot, next Tuesday. He seems pretty relaxed about the whole thing, which is quite a relief because his tendency is to be somewhat, shall we say, dramatic about anything involving needles in his personal space. I went with him the other day for his pre-op medical clearance appointment, and when the nurse suggested he get a flu shot as long as he was there, you’d have thought she’d just asked him to donate a kidney. Wimp. 6. One of my New Year’s Resolutions has to do with a better — maybe the word is regular — job with my housekeeping chores. It would be great, I thought, to hire someone to come every other week or so. But that’s not exactly in the budget, so then I had the brilliant idea of “hiring” myself to do it. I mark on my calendar the days the “cleaning lady” is supposed to be here, then I set aside those days to do all the things a real cleaning lady would do. If I had one, that is. So far this has worked exactly … once. I totally skipped it this week, but in my defense (I can’t believe I’m “defending” myself over this. So lame. ), what with all the construction going on, what would be the point? 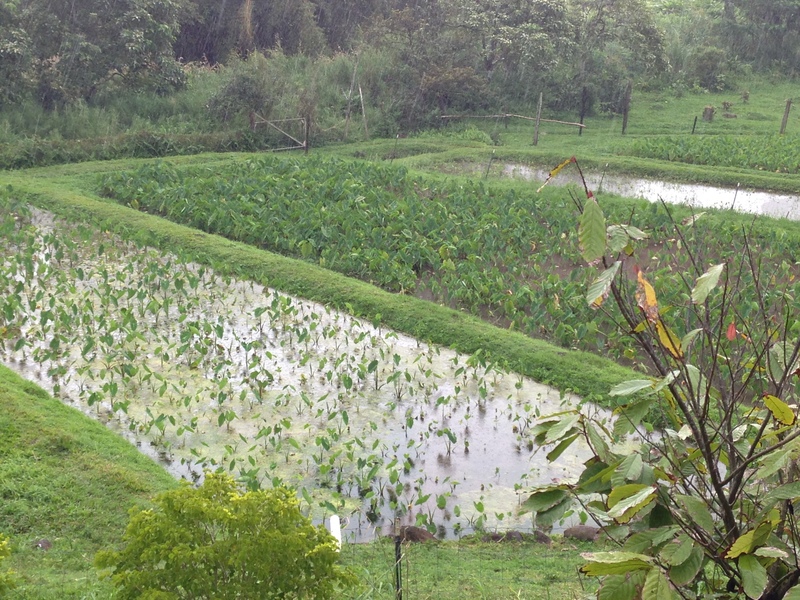 Taro is grown in muddy-water rice paddy type plots known as lo`i. The one on the left has been recently planted; the one on the right is more mature but not yet ready to harvest. And yes, it’s raining. Here’s what a taro plant looks like up close. In the Hawaiian diet, the whole plant is used, from the root, which is where poi comes from, to the leaves. This entry was posted in Kids, Life in My Hawai`i, Random stuff, The Coach on February 15, 2013 by plum. We all know Horace Greeley’s counsel: “Go West, young man.” Ever the contrarian (as well as neither young nor a man), I am turning that on its head, and going East. The other day as I was scribbling some memoir-ish thoughts about how I made the decision to move back to Hawaii from California three-score years ago, my memories were filled with the usual Hawaii imagery: sea, sand, sunsets, palm trees — and how they all combined to persuade me that leaving the mainland then was best for my twenty-something self. That turned out to be a very good decision, because two years later I met a guy who also was born and raised here, went to California for college, then moved back home. We fell in love (Happy Valentine’s Day, Honey! ), got married, and were perfectly content with the idea of living happily ever after here on our little island in the middle of the Pacific. Not that there’s anything wrong with the mainland. Some of my best friends live there. But sometimes circumstances — in our case, an opportunity plus a certain fatigue — combine to persuade you to go back the other way, which is how we will later this year be heading off to Oregon. But not forever; only for about four months. So not exactly a move, per se. But kind of. The opportunity happened because our girl, a junior in a lovely liberal arts college in Oregon, is volleyball player like her dad. She was recruited out of high school by a coach who is also an old friend of ours, a guy who grew up here. For the past three years, he has been dropping hints to The Coach to come up there and be his assistant. All that time The Coach has had his own team to be responsible for, so it was easy to brush off all the hint-dropping. But the fact is, coaching high school girls has gotten a little less fun every year. No doubt about it, his team has done consistently well, he loves his players, and they love him back. However. The parents. Oh, those parents. Parents of student athletes these days can be, you know, you’ve heard all the stories … nightmarish. A couple years ago The Coach started to feel a little like Rick in The Walking Dead: a survivor surrounded by flesh-eating zombies. At one point he had to say, that’s it; no more parents in the gym, watching practices and questioning the goings-on therein. While possibly trying to eat some poor coach’s brains. Of course not every parent is that way, but still, it’s a wonder anyone signs on to coach any high school sport anymore. After 30 years, The Coach knew that he had seen it all and done it all — at the high school level — and why not just step away from it before total burnout set in? So the hint-dropping began to have its desired effect and the idea of coaching our girl in her senior season took root. But how to make that happen? Because actually coaching is just a part-time gig for him: his full-time, i.e., “real,” job is teaching P.E. to young elementary students. Which, as you might imagine, keeps him plenty busy. Ever tried keeping up with, much less instructing, two dozen six- and seven-year-olds on a playground for 35 minutes straight, six times a day? I rest my case. So, to sum up: 30 years of coaching teenagers plus the same 30 years of teaching little kids, equals oh man, am I tired and in need of a break. As in, a sabbatical. But not a sabbatical to coach volleyball, exactly. In order for him to get approval to do this, he has to be studying something or working on a project that he can show is going to make his teaching, when he comes back from the sabbatical, ever so much better. The project he came up with, proposed, and will be working on while coaching our girl and her team in Oregon, is pretty cool. But it’s a story — with pictures! — for another day. So stay tuned. This entry was posted in Sabbatical saga, The Coach, Work on February 14, 2013 by plum.